About ten miles north of the ancient city of York, the peaceful village of Sherriff Hutton is home to a gap-toothed ruined castle and a campsite which is in many ways in an ideal location – handy for both the city and some of the best of the glorious North Yorkshire countryside. Situated on the edge of the Howardian Hills AONB, between the Vale of York and the North York Moors National Park, the glamping here is comfortable and well-appointed, with two pre-pitched tents offering a great balance between home comforts and outdoor living, and equipped with everything you need for a fully-fledged family holiday: two bedrooms with proper beds (the tents can comfortably sleep four adults or a family of six), a fully stocked kitchenette and an extending living area with an outside verandah on which you can nurse a drink while ruminating on the day's activities. The site is prettily planted with trees, and very well maintained, and has good, up-to-date facilities. It's also just a mile or so outside Sherriff Hutton village, which has a couple of pubs and and a post office. As regards things, to do, the surrounding countryside is green and gloriously gentle, great for walking and cycling but with a host of high-grade attractions too, not least Castle Howard, one of the grandest stately homes in the country. There are also the peaceful ruins of Kirkham Priory, the nineteenth-century Benedictine abbey at Ampleforth (famous for its school), open to visitors and selling its own cider from its shop and visitor centre, and the restored eighteenth-century of Howsham Mill, which has been recently restored and mounts interesting exhibitions on renewable energy. 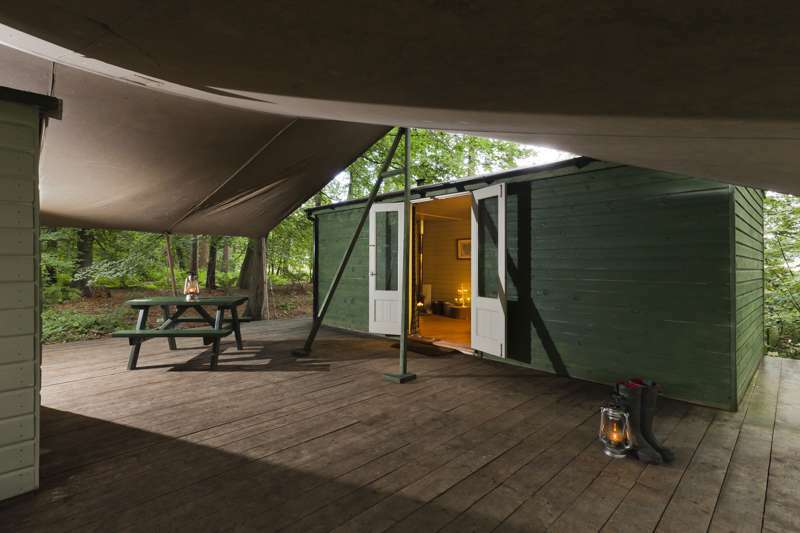 All in all a perfect place for a peaceful glamping break. The campsite is just a mile southwest of the sleepy village of Sheriff Hutton, which is home to the gappy ruins of Neville Castle, a medieval fort built in the fourteenth century that still towers over the village today. On the other side of the village, a few miles to the northeast, Castle Howard (01653 648333) is probably the area's main tourist attraction – not only a supremely elegant country house, built by Sir John Vanburgh in 1699, but a magnificent estate too, with amazing grounds, gardens, lakes and follies. Not far from Castle Howard, just across the A64, the ruins of Kirkham Priory (01653 618768) are also worth a visit, as is Howsham Mill (01653 619712), a couple of miles south. Finally there is York, one of the finest intact medieval cities in England, and with plenty to see – not least its famous Minster – though it's in general just a beautiful place to wander aimlessly, taking in its plentiful pubs, shops and restaurants at the same time. Sheriff Hutton is home to a couple of friendly pubs, the Highwayman Inn (01347 878328) and the Castle Inn (01347 878335), both of which serve food. In York, we like Cafe No 8 on Gillygate (01904 653074) for lunch or dinner, Cafe Concerto (01904 610478), right by the cathedral, for lunch, dinner or even a hearty breakfast, and of course Betty's famous tearoom at any time of day (01904 659142).